Stand by for incoming content, agents of The Division. Ubisoft has detailed some of the highlights headed to the post-viral apocalypse shooter as part of May 24's update 1.2, and there's quite a bit to sink your teeth into. Clear Sky is a three-part Incursion mission where you'll need to wrest an anti-air missile site from the Rikers, clear the skies over Manhattan, and reclaim stolen supplies. Meanwhile, new items such as the Predator's Mark and the Centurion M1911 pistol will keep you shootin' and lootin' all the live long day. Update 1.2 will also add "High-Value Targets" - exceptionally strong enemies that will only be available for a limited time. Learn more about them by speaking to an HVT officer inside your base of operations and take them down to earn better gear. But the real kicker is an added feature to the Dark Zone. 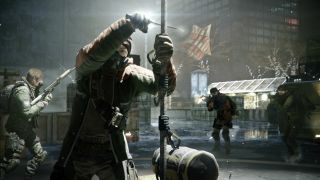 When update 1.2 goes live, rogue agents will be able to cut the rope on supplies being extracted out of the Dark Zone, which will cause all of that loot to drop to the ground and be free for the taking. It's a fabulously dickish way to screw people over, so be on the lookout for anyone standing too close to your stuff.